I've been getting back into calculators with my son who is now taking the scientific route in high school. 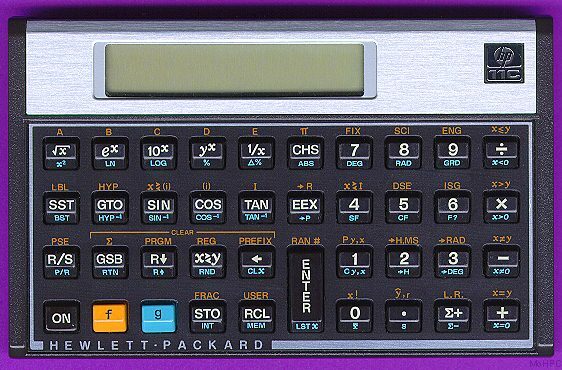 I previously owned two HP11Cs that were both stolen, the last of which was approximately 20 years ago. I have a new 35s and 50g and really haven't spent much time with them. I've always wanted my trusty 11C back so I decided to buy one off eBay. I bought a nice HP11C unit and it passes the self test and keyboard test. Nonetheless, during use, I have an issue where the functions of my plus ('+') and minus ('-') operations seem to be reversed. I tried to do a memory reset and the display flashes 'running' and doesn't stop. Is anyone aware of this type of behavior? Can it be restored somehow or is it likely a hardware problem. If hardware, can the hardware be fixed? Sorry - it's been a while so I have lost some familiarity with the device. I'm hoping there is a simple solution. As a sanity check, look at a picture of an 11C on this site and make sure the + and - keys are not physically swapped on yours. Just in case. Eureka! Any idea how I can switch the key positions? I've taken the cover off the back but not sure how to pull the board and keys. Given how difficult it is to disassemble and reassemble a Voyager keyboard on an otherwise perfectly working calculator, you might consider making labels for the two keys involved. I'm not suggesting something as complex as was done for the WP34s but using a picture of an HP-11C and printing the keys on self adhesive paper may not look so bad. Just a thought. Great idea. Appreciate that. I'm guessing this little problem is what kept this unit in the box for so long with minimal use. I am also investigating http://vintagecalculatorrepair.com. Any awareness of their reputation or other repair facilities I might consider?